Robert Rattray’s commission for The Queen’s Coronation in his own words. 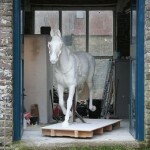 It was in January 2012 that I was contacted by Rosemary Ussher, who heads up the Windsor Greys jubilee appeal fund, to ask whether I would take up the reins on an exciting sculptural project. 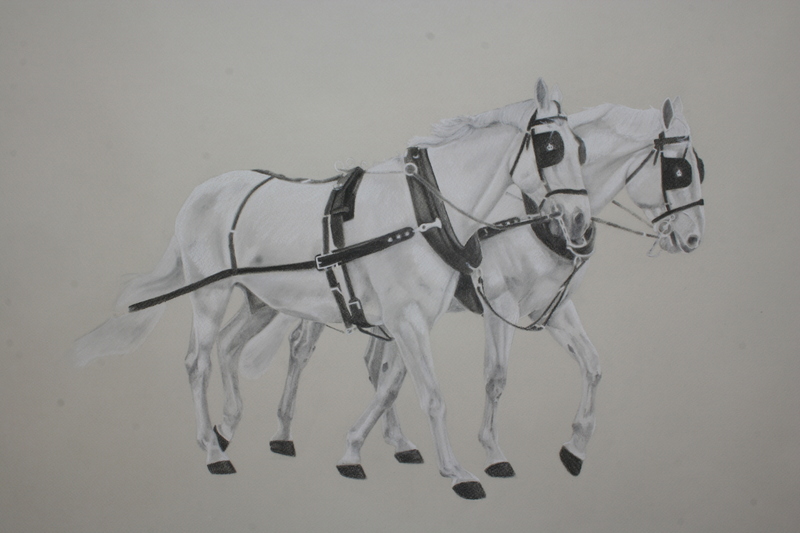 This enterprise aims to commemorate the 60th anniversary of the Queen’s Coronation with a life size sculpture of two of the lead carriage horses used in state occasions, known as the Windsor Greys. These magnificent beasts are often seen around Windsor on state occasions or while exercising, so their sculptural homage will be installed close to the stables of its subjects, on a local roundabout, at the Albert and Kings Road junction adjacent to the Long Walk, in Windsor, England. So far, however, the project had been beset by tragedy. Althea Wynne – the sculptress originally contracted by the fund – had been killed in a car accident, alongside her husband Antony Barrington Brown, as they returned from a discussion of the project with their foundry. I was sent some of Althea’s working designs, which gave me a tremendous insight into her ideas, and it was with these images in mind that I set off to study the Windsor Greys. The Royal Mews kindly facilitated a visit during which they introduced me to the chosen animals which I discovered to be very different, not only in size but also in character – one a stalwart leader, the other relatively new to leading and clearly impressed by his elevation. Observing this, I decided to try to approach this sculpture from a dualistic stand point. The older horse’s more blasé approach contrasted wonderfully with the younger’s more eager attitude. From a physical perspective the younger horse had the edge, and I suspected both animals knew it. I knew that I wanted these individual personalities to be translated in their likenesses, through capturing their energy with a looser style of sculpture, so that they could be recognised by those who know them. Armed with photos, video and measurements I returned to my studio, where my first job was to create some drawings; with the kind permission of Her Majesty the Queen, these were made into prints for fund-raising purposes, and are still available for sale. I then began to design the maquette, in a scale one fifth of the life size. Starting with the younger and larger horse, I focussed on his eagerness: at 17 hands (173cm to the top of the shoulders) he is a daunting size; the power that is transmitted through his upright motion is fantastic. It was my aim to capture this, enabling the viewer to experience my own feelings when I somewhat foolishly attempted to take a head on photo of him in full ceremonial trot. In childhood memories of family horses I recalled them careering across the field or displayed a slower nonchalant plod as they made their way over to greet me. The younger horse with his boundless energy was clearly going to be the careering one. His sculptured form would be one of constrained eagerness, his power held in check not only by the invisible reins, but by the casual plod of his more experienced, slightly smaller and wider neighbour, the yin to his yang. 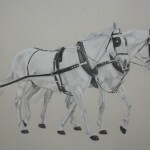 The first horse was started in July 2012, which coincided nicely with a baking hot spell of weather. In contrast, the second horse was started in December 2012, with ensuing hours spent carving in the cold…suffering for my art at two extremes! Having achieved the desired feel, I then coated the basic polystyrene sculpture in plaster, the surface of which could then be worked and refined with a mixture of tools – garden saws, rasps, and occasionally a hammer when my concentration had clearly lapsed. The end result is a sculpture with a worked surface texture akin to an etching. 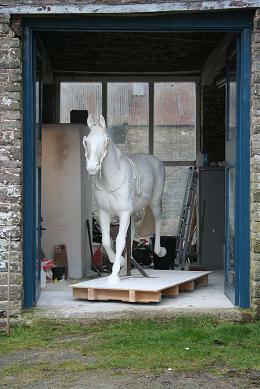 At last I am left in my empty studio, the second horse having left for the foundry. Whilst procrastinating the inevitable cleanup operation, I sit hoping that when this sculpture is installed the viewer will see two very different characters, two very different horses. Written by: admin on June 25, 2013.